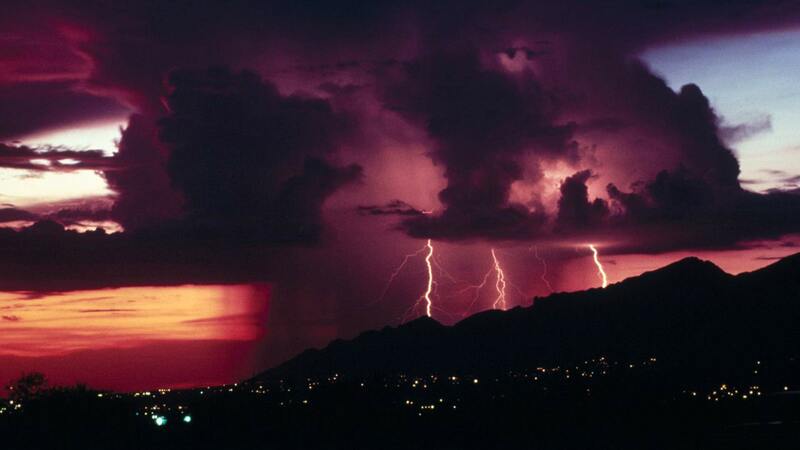 A file photo of lightning striking the Santa Catalina Mountains. A weather system that moved through the Tucson area Sunday brought more than an inch of rain in some parts of the Tucson area and also ignited three fires on the Santa Catalina District of the Coronado National Forest. Two of the three fires were extinguished by crews, while forest officials chose to keep watch on the third. "It's really in steep, rugged terrain where it's not a safe idea to put firefighters, so it's in monitor status," said Coronado's Heidi Schewel. "This is not atypical for this time of the year as the monsoons are starting to roll our way." Naturally occurring fires come with a decision for public land managers. The fires can either be treated as a human-caused fire and extinguished as quickly as possible, or they can be managed for benefits such as clearing away fuels like dead vegetation. The choice is made on a handful of criteria. The first, according to Schewel, is firefighter safety. "Then we look at the values at risk," she said. "We also look at what's going on with the fuels, how dry are things. Where is the fire? What kind of threats could it pose?" National Weather Service forecasts predict more thunderstorms throughout the area, which could bring with them a chance for more naturally-occurring fires.